Photograph collection of webmaster 25167 & ?? deliver new electric multiple units to ?? passing an unknown location. The nineteen & a half year career of D7517/25167 was spent allocated to a variety of London Midland & Western Region depots. 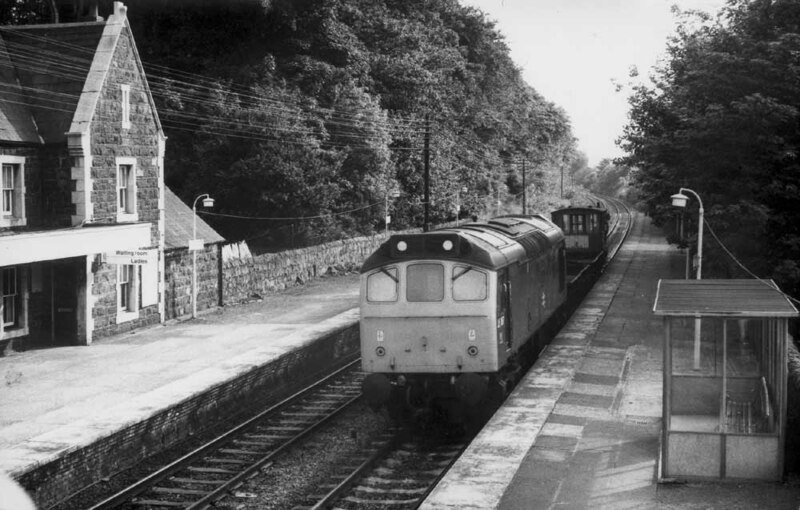 July 1972 to Ebbw Junction (86B). 25167 was the 182nd Class 25 to be withdrawn, one of six retired during May 1983, sister locomotive 25168 was retired during the same month. 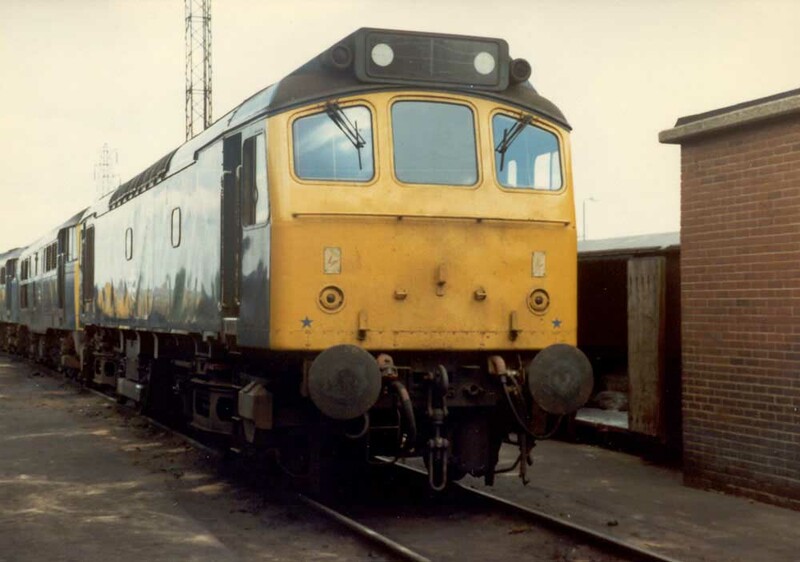 After withdrawal 25167 was stored at Crewe before being moved with 25120 (from Springs Branch) and 25152/167/168 (from Crewe) to Swindon Works between February 9th & 15th 1984. 25167 was broken up by the middle of April 1984. 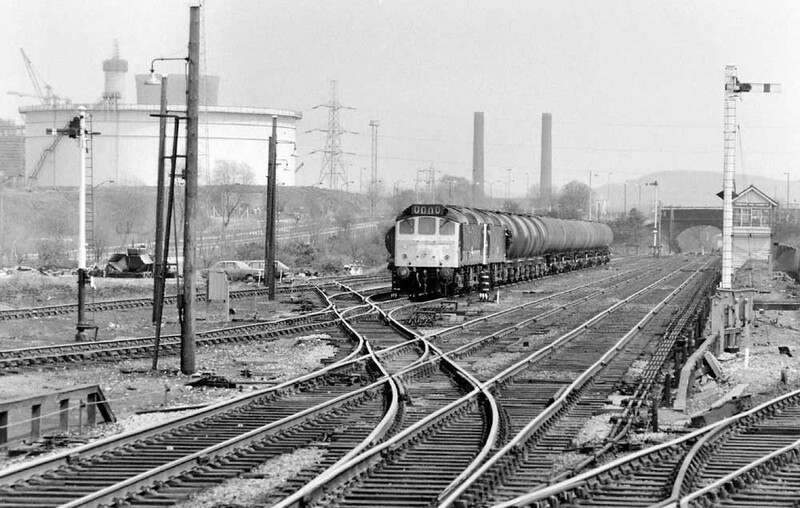 Noted Derby Works April - June 1979 (General repair). 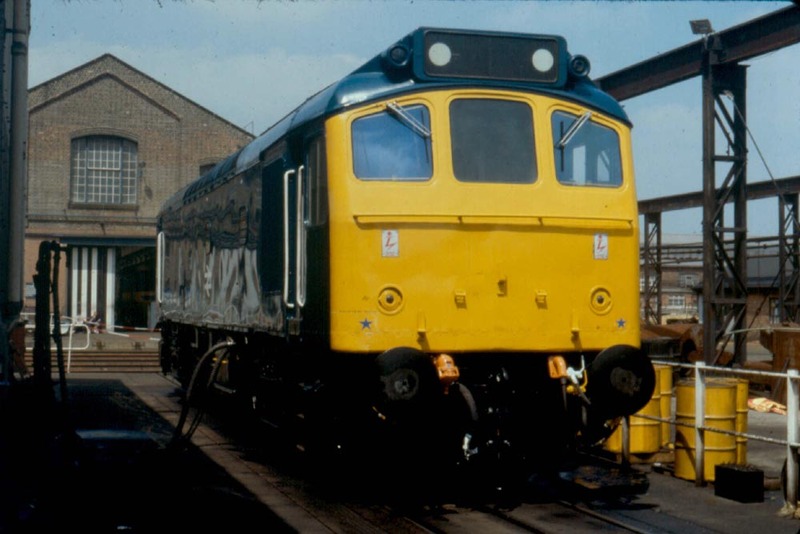 Photograph courtesy John Glynn A very smart 25167 is fuelled on June 20th 1979 prior to returning to traffic after completion of a General repair. This repair would provide 25167 with almost four more years service, being withdrawn from Crewe during May 1983. Just prior to its transfer to Ebbw Junction 7517 worked the Walsall - Norwich (for Yarmouth) - Derby diagram on June 17th 1972 with 5211. Whilst allocated to Western Region depots only one passenger working was recorded. On January 24th 1976 the 13.30 Paddington - Paignton with 47027 failed at ?? 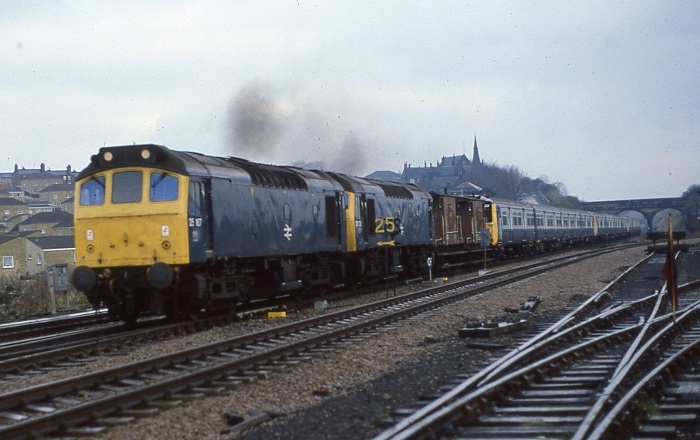 25167 & 25158 were sent out to drag the service to Exeter St. Davids where all locomotives were replaced. Sometime early in 1976 (maybe earlier?) 25167 acquired a scrape down the full length of the Battery Isolating Switch side of the locomotive. It would run with this distinguishing mark until repaired at Derby Locomotive Works during April 1979. Photograph courtesy David Rapson Stanlow and Thornton on April 28th 1976. A panoramic view of 25167 & 25249 as they run around their train of tanks. 25167 has acquired a lengthy scrape down most of the bodyside. The view is looking eastwards and is taken from the platform end at Stanlow & Thornton station. After transfer to Crewe early in 1976 25167 worked a modest selection of passenger workings until its withdrawal in 1983. On August 14th 1976 25167 & 25209 worked the 09.20 Manchester Piccadilly - Yarmouth as far as Lincoln Central, returning with the 09.15 ex-Yarmouth. A late evening roundtrip on the North Wales mainline took place on June 2nd with 25167 working the 20.30 Crewe - Bangor and the 22.45 Bangor - Llandudno Junction. Later in the month 25167 & 25142 were busy on the NE/SW route, on June 23rd they worked the 15.15 Plymouth - Manchester Piccadilly forward from Gloucester to Birmingham New Street. On July 6th 25167 & 25027 were noted hauling a trainload of stone from Cauldon Low Quarry down to Leekbrook Junction, the stone was ultimately for use in the construction of the Thames Barrier. The 11.11 Manchester Victoria - Holyhead was worked to Chester by 47450 where 25167 took over. On July 28th 1979 25167 & 25150 worked the 12.32 Skegness - Leicester forward from Nottingham. Just over a year later on August 14th 25167 worked the 20.30 Crewe - Bangor. On January 31st 1981 25167 rescued 25042 whilst working the 10.00 Crewe - Cardiff, going forward from Shrewsbury. Photograph collection of webmaster 25167 eastbound at Llanfairfechan on July 3rd 1981. A picture of contrasts, the modern bus shelter style waiting area contrasts with the solid stone station building, yet the bus shelter contains a bench seat from a different era. The Class 25 and its short train looks at home with the telegraph poles supporting a multitude of wires, whilst in the garden of the station house someone's washing blows in the breeze! It was off to Aberystwyth on August 8th with 25150 working the 10.10 Euston - Aberystwyth forward from Birmingham New Street, returning with the 18.00 Aberystwyth - Wolverhampton. Later the same month, on August 20th 25167 worked the 12.15 Holyhead - Crewe throughout. On August 24th 25115 & 25167 were noted eastbound through Gloucester with a mixed freight. On September 1st a diesel multiple unit failure saw 25167 work the 17.15 Nottingham - Birmingham New Street as far as Derby where 25279 took over. 1982 saw the last passenger workings for 25167, which included some familiar turns. On June 6th 25167 worked the 09.50 Manchester Victoria - Llandudno Town and the 14.20 return. On July 28th 25167 & 25224 worked a roundtrip Derby - Aberystwyth day excursion, a total of 401 miles (out via Leicester and Birmingham, return via Walsall). The excursion was running late and its arrival at Aberystwyth delayed a local service due to the recent closure of the signalbox and a rationalisation of the trackwork available for passenger movements. Two weeks later on August 14th 25167 was at the other end of the country, working the 11.55 Glasgow Central - Carlisle, whilst the next day (15th?) 25167 worked the 09.50 Manchester Victoria - Llandudno Town and the 14.20 return (date maybe uncertain). On August 21st 25167 was on banking duty at Manchester Victoria. Photograph courtesy Jerry Glover 25167 & 31279 at Toton on August 28th 1982. On September 2nd 25167 worked the 4V20 15.02 Manchester Mayfield - Bristol Temple Meads parcels vans. Most unusual visitors to Eastleigh on the morning of January 14th were 25161, 25167 & failed 25230. They had arrived on an unidentified freight and turned on the loop at the diesel depot to keep the failed 25230 at the rear of the trio as they headed northbound light engines. 25167 was withdrawn on May 29th 1983. Page added March 10th 2013. Last updated January 20th 2019.